If you look carefully, you can see that a squirrel chewed an open area in this soffit vent screen. I set a repeater trap with what is called a nose cone, in order to force the squirrel into the trap. When it came out, some pink attic insulation came out as well. This kind of trap does not need bait, but just to help out the process, I baited the trap with orange slices. Why orange slices? They're not normally part of a squirrels preferred diet. The answer is that I knew this squirrel was thirsty, and squirrels know there's moisture in oranges, so it wanted the fruit for the hydration. 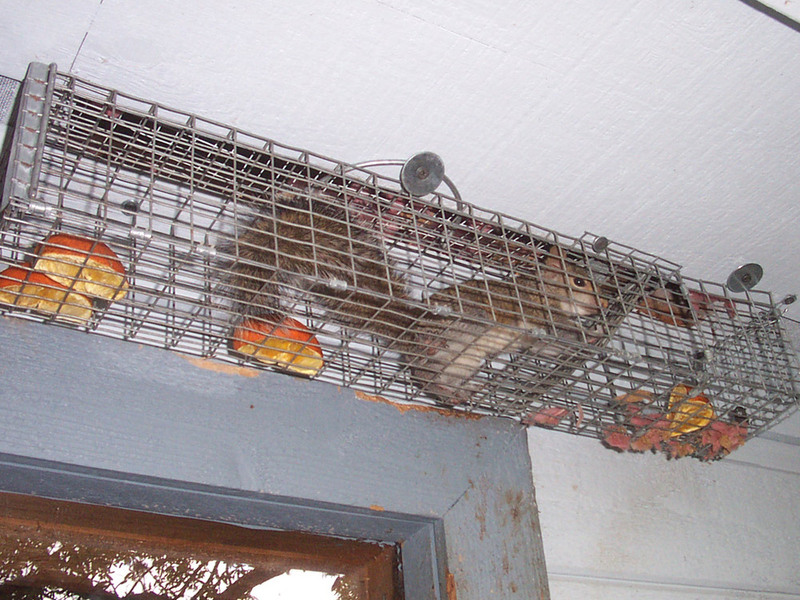 Thus in this case, oranges encouraged the squirrel to go into the repeater trap. Go back to the main how to get rid of squirrels page.